I just got back from a trip and didn’t want to go grocery shopping, so if I wanted to eat I was stuck with what I could find in my freezer and pantry. Nor did I feel much like cooking, so I wanted something that could be prepared with minimum fuss. I considered eating nothing but the chocolates from my Christmas stockings, but this seemed to be an unwise dinner choice for a person susceptible to migraines. So I opened the freezer. On top of everything was a gallon bag containing a dismembered head of cauliflower I’d hastily tossed in the freezer prior to my departure. Beneath it was a log of frozen ground turkey. Cauliflower is great in curries, and I immediately thought of the turkey curry recipe I posted in August 2015. Here it is in a new, wintry incarnation. Heat oil in a large pot. Add turkey, garlic and onion. Cook on medium to medium-high, stirring frequently to break up turkey and prevent burning, until turkey is browned and cooked through, about 10-15 minutes. Mix in coconut milk, broth, lime juice, lemon juice, fish sauce and curry paste mixture. 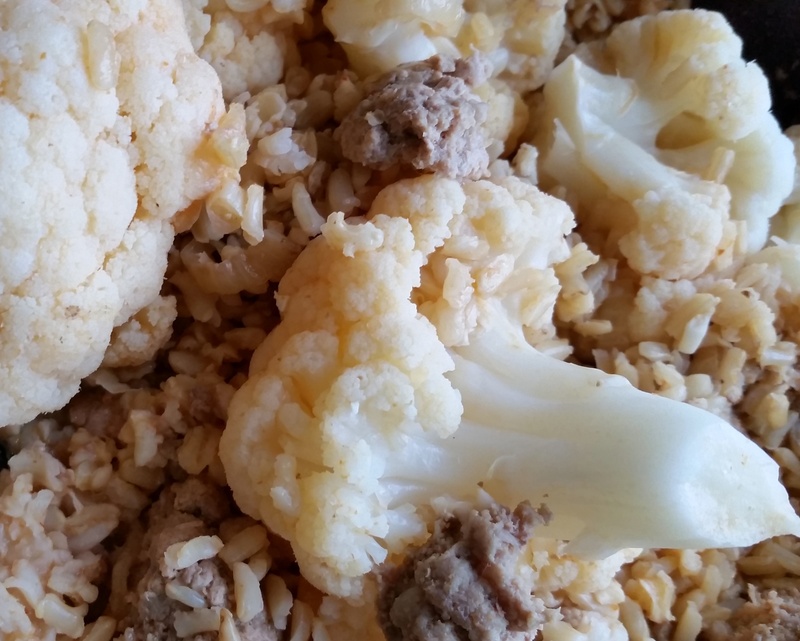 Bring to a simmer and layer cauliflower on top. Cover. Remove from heat. Let sit until rice is tender, about five minutes. Serve.